If you are a regular visitor to our blog you will have noticed that being a National Trust Ranger has many varying different tasks and responsibilities, for instance. The Upland Ranger, fix miles upon miles of the Lake Districts Fell top paths, their skin hardened by the elements and suntans any antique dealing TV presenter would be proud of. The Estate Team, endlessly & tirelessly mending broken fences and wall gaps, ensuring lost or misguided wanderlusters continue safely on their quest for the ultimate 'WOW' by simply pointing them in the right direction! The Woodland Ranger, rarely seen without his trusty tail wagging companion, will have a dangerous path side tree felled and tidied away in the time it takes you to consider if anyone was around to hear it fall? The Car Park Ranger! ... Before you swiftly scroll away to a story of epic endeavour I want you to know that I am going somewhere with this story. My main role is managing the presentation of the car parks (5 in total for the South Lakes), filling in potholes, fixing drains etc etc. 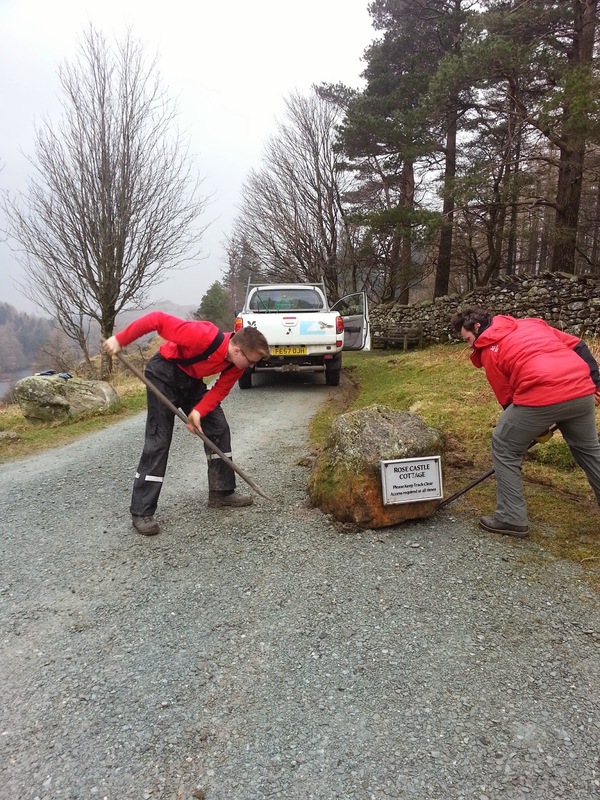 I also assist the team with the maintenance and upkeep of certain areas the car parks are attached to such as Tarn Hows, Blea Tarn and so on. This means I have the pleasure of traveling around our property the most. This encompasses the sleepy village of Little Langdale, the rugged landscape of Coniston, the beautifully picturesque market village of Hawksead and the wild wild western shore of Windermere, in particularly what is known as Claife Heights, and what is a personal favourite of mine. Claife is steeped in folklore, legend and history, most noticeably at Claife viewing station. Originally built in the 1790's by Rev William Braithwaite, to entertain wealthy visitors to the area. Legend has it that the windows were varied in colours to create a 'WOW' effect to the views over Windermere deemed so amazing that female visitors were given mirrors to witness the views in reverse for fear of swooning. The Viewing Station (not the Cottage & Courtyard) passed to the National Trust in 1962 as part of a 1000 acre estate. Sadly the building which once stood as a grandiose beacon for the picturesque movement had become quite derelict, and beyond repair. With the help from donations, legacies and various project funding (such as Windermere reflections) the station once again stands proud as a beacon of artistic movement. You can now discover this amazing structures colourful past and enjoy the Panoramic views of Windermere as they were enjoyed over 200 years ago (N.B. mirrors are not supplied just yet). The station challenges all your senses, from textures of the building, the views over lake Windermere and the slightly chilling sound of the Aolean wind harp. No National Trust property worth its salt should come without it's very own Cafe and, Claife is no exception. So after you've absorbed the views of the Lake you should wander down and grab yourself some freshly made cake, a coffee or a pot of freshly made tea from local, family-owned tea specialists 'the New Leaf Tea tasters' (located just 5 minutes away). The Cottages are a very recent addition to the National Trust family. They came into our possession in 2010 and were built c1800. From the early 20th century to the 1960's these cottages served as a tea garden. South Cumbria Construction, along with the National Trust labour teams have done a fantastic job of bringing these cottages to their former glory, and are in effect an attraction in their own right. Sit in, or sit outside in the young gardens underneath the wooden gazebo. We hope you will come and visit us at Claife, it's testament to the hard work everyone has put in over the last year or so, and it's particularly warming to see this almost unrecoverable building standing proud once more. In the South Lakes property we look after millions of trees, most are in our woodland but many are large individual trees scattered across the countryside which make a huge impact on the landscape. Sadly nothing lasts forever this is especially true of trees, old age and the weather take their toll. The weather this winter has seen a double whammy the combination of waterlogged ground and high winds often means we loose a few of our larger trees. Large ash tree fallen into the road following a night of high winds. Its sad when an especially large tree falls, this was the case at Monk Coniston when one of the largest beech trees fell after a particularly stormy night. Beech fallen at Monk Coniston. Phil the forester cutting the root plate. Gary removing damaged branches from neighbouring trees. The tree was 195years old so it would have been familiar to Marshall who created Tarn How while he lived at Monk Coniston. When trees this size fall they create an enormous amount of mess to tidy up and it's a team effort to get roads and paths cleared quickly and safely. One of the challenges we face is how to retain these trees which are often part of famous views or paintings and ensure that there are young trees being planted to grow for the next generations to enjoy. Tree planting opposite Hill Top. Trees are planted in cages to protect them from browsing animals. I reckon the cages should last for about 20 years, by then the tree should be established and big enough to look after itself! Part of the planting this winter has been to restore the designed landscape around Wray Castle in all 94 trees were planted. We used a map from 1888 to locate where the trees were missing, sometimes there was an old tree stumps in the field so we planted replacement tree next door. We planted a mixture of oak, beech, sweet chestnut, small leaved lime and sycamore much the same as the Dawson's in the 1840s when they created the Wray Castle estate. 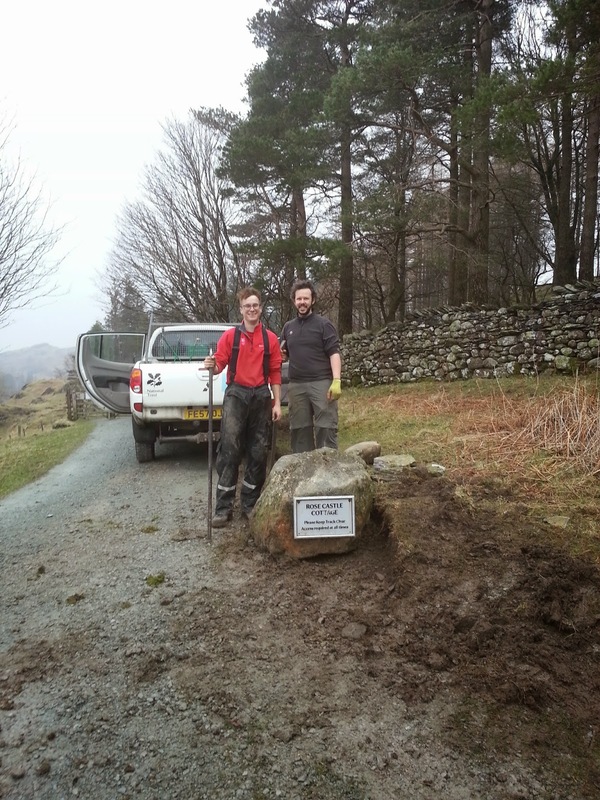 The footpath team down from the fells tree planting at Wray. Cages well on the way to completion. For the planting closer to the castle we re-cycled metal tree cages from Knightshayes. The ground in the lakes must be stonier than the parkland in Devon as we couldn't hammer the metal fixings all the way home which meant some in the field adjustments had to be made! Me tightening the last bolt on a metal tree cage. Old and new trees on Epley Head near Wray Castle. Hello! 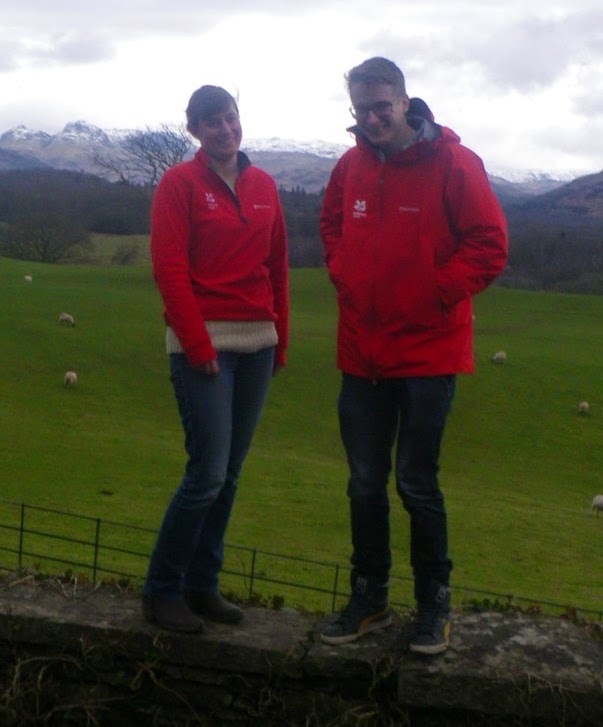 We are Ted and Abi, new volunteer rangers with the team at Boon Crag. So far we’ve had a variety of work and weather testing our waterproofs to the max, wellies full of water, but soaking up beautiful views too! No two days are the same. Abi has been ‘chopping and shifting stuff’ at Claife viewing station. She has yet to get a well-earned brew from the new cafe opening on 28th March!! Ted has learnt how to use an angle grinder, the power barrow, and was asked the question ‘how do you shift a tonne and a half boulder?’ Easy: 3 rangers and a lot of grunting. We are looking forward to getting stuck in to the full scope of being a Ranger within such a diverse and interesting property. …And the most important thing we have learnt is to never be further than 10 meters from your lunch! Working holidays are a great way to get involved with the National Trust’s work and some people return many times to take part in them. Some go that extra mile though and Di Lang is a great example of this. A long standing working holiday leader (the leader is not staff but takes charge or housekeeping, shopping, menus etc), Di led her first holiday here at High Wray back in 2004 and recently returned here to lead her 100th! Di has led holidays as diverse as Drystone walling and hedgelaying, woodland management and running events. We’re particularly thankful for her formidable organisational skills and boundless enthusiasm in leading our upland adventure holidays, where participants camp out on the high fells for three nights and work to reduce path erosion in the day. We’re looking forward to many more years of working alongside Di, with another camping holiday scheduled for this May. It’s thanks to the dedication and hard work of leaders like Di (and there are plenty of others too) that the National Trust is able to offer such a varied and interesting working holiday programme, enabling many people to get involved with our work and help us look after our special places for everyone.